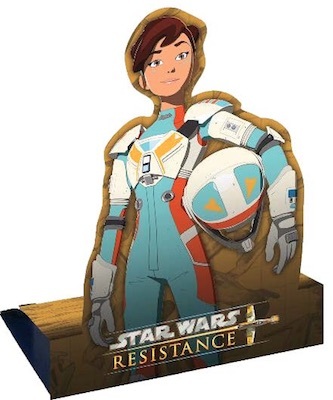 2019 Topps Star Wars Resistance Season 1 covers the first year of the animated series with a retail-only set. The "Suprise Pack" format features traditional trading cards alongside exclusive extras like mini albums and danglers. Although the popular sci-fi franchise has seen several animated versions, Star Wars: Resistance opts for an anime style. The show started in 2018 on Disney Channel. 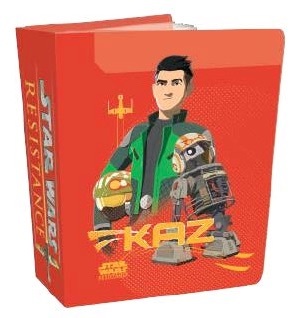 Featuring specific moments and key characters from the first 21 episodes, 2019 Topps Star Wars Resistance Season 1 has 100 cards in the base set. In addition, low-numbered parallels include Bronze (#/50), Silver (#/25), Gold (#/10), Red (1/1) and Printing Plate (1/1) versions. The insert lineup adds Foil Character cards, Pop-Up cards and Temporary Tattoos. 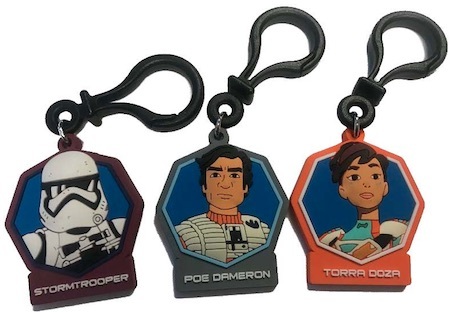 The 2019 Topps Star Wars Resistance Season 1 checklist also has a few bonus options. Hanger boxes are the only place to find the 40-page mini albums. These come in specific editions for Poe, Kaz, Torra and Bo. Danglers are another choice. Exclusive to Value Blaster boxes, fans can hunt down all 12 clips to add some decoration to a backpack or jacket. PARALLEL CARDS: Bronze #/50, Silver #/25, Gold #/10, Red 1/1, Printing Plates 1/1. 74 Recovering from Neeku's "Test"
4 albums. Hanger box only. Just curious if you know what the prices are supposed to be. I saw them at Target today and hanger boxes scanned at $5.99 for 3 packs and a mini album and blasters scanned at $19.99 for 6 packs and a dangler. Just didn’t seem to add up. Unless there’s something I was missing. Blaster price seems high. I thought they were $10.